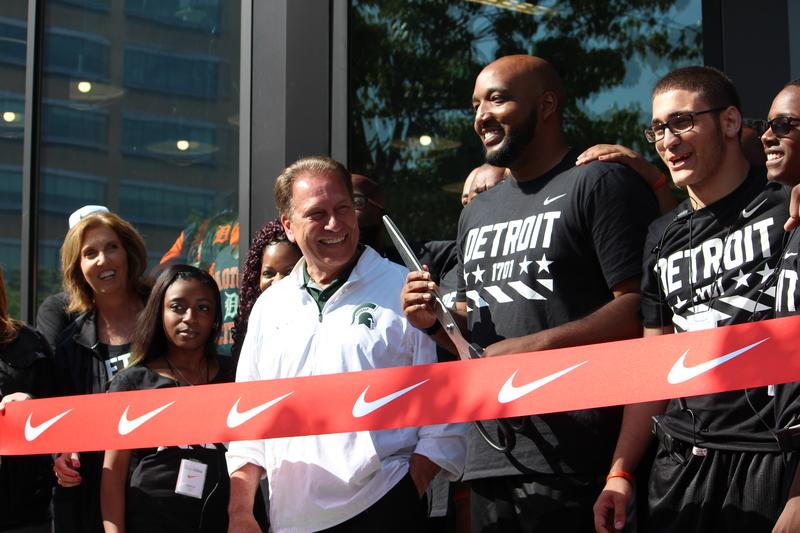 Nike’s first “Community Store” in Michigan opened its doors today in the heart of Detroit. The excitement surrounding the store’s grand opening was evident from the line that wrapped around the corner of Woodward and Grand River. The Nike Detroit team hyped up the crowd as they led them in waves through the door, chanting “Nike! Detroit!” Customers eagerly spread out over the two-story, 22,000 square-foot retail space. Inside, there were rows of shoes and racks of men’s apparel on the first floor and women’s clothing downstairs. Brittney Hackshaw, 19, was one of the hundreds of shoppers that was thrilled to have a Nike store in their hometown. “It’s pretty cool that I now have somewhere close to home to shop for shoes and Detroit sports apparel – it’s more convenient for me,” she said. The Detroit Community Store will offer annual grants of $5,000 to eight local non-profit organizations via the expanded Nike Community Impact Fund. Dennis van Oossanen, VP and GM of North America Direct-to-Consumer, says that “by expanding Nike’s Community Store concept to include local grant programs, we look forward to fostering even deeper connections that empower young leaders where our store teams live and work.” To further assist with fostering that connection, the new space will also aim to hire at least 80 percent of its team from within a five-mile radius of the location. The new Nike store is located in the historic F.W. Woolworth building at 1261 Woodward Avenue Detroit, MI 48228. It is open Monday through Saturday from 11 a.m. to 8 p.m. and Sunday from 10 a.m. to 6 p.m.